Without any of my trademark cynicism, I can honestly say that my kids are the greatest reason to be thankful. “I like mashed potatoes,” said Georgia, which is not surprising as she pretty much only eats plain white carbs. And there we have their personalities as they stand right now. Ruby: Cranky tween, focused mostly on the negatives. Georgia: Cheerful but picky 6-year-old. Elliot: Sleepy, hungry, easygoing teenager. There was a time, back pre-kids, when Thanksgiving was more of a Food Olympics for me. I saw it as a chance to try out new recipes, which I’d start road-testing on friends weeks in advance; to make elaborate, expensive, luxurious appetizers and desserts and side dishes; to try new and different ways to roast a turkey: brining, different aromatics, basting vs. no basting, various compound butters slathered all over the skin. 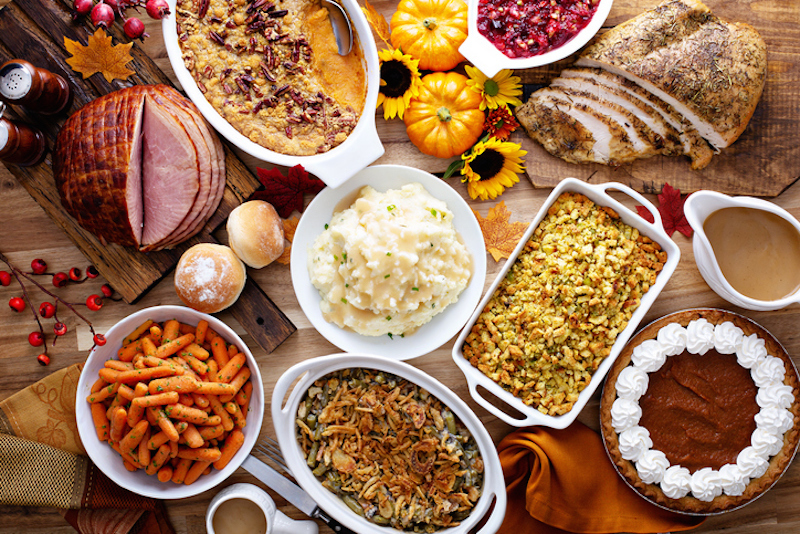 In recent years, however, I may have experimented here and there with a new dish or flavor, but by and large, everything we serve on Thanksgiving is a classic, simple recipe. We roast a turkey with butter and salt and pepper; we mash potatoes with butter and cream and salt; we blend sweet potatoes with bourbon and brown sugar; we boil cranberries into a beautiful molten goo flecked with orange zest; we bake a simple sage-and-onion dressing on the side; and I always make a pumpkin-and-black bean soup (the only non-dessert that Ruby likes) and a couple of pies. But as the food stays the same, our kids are changing more and more. When Robert and I had our first Thanksgiving together, Elliot was 10, Ruby was 4, and Georgia was still referred to as The Lady Fetus. Now Elliot is 17 and in the National Honor Society. He is taller than I am with a voice that sounds exactly like his father’s, and every day, he gets a little more sophisticated and talented. He plays piano so well it still shocks me, he gives me great advice about how to find memes that aren’t lame, and he has never met an animal he hasn’t wanted to save. Ruby is a month away from 12, and while last year she was into American Girl dolls, this year she is into roller derby. She’s a straight A student who loves YouTube, theatre and science, and she is both my favorite person ever and the biggest challenge in my life. I never know whether I am about to get a hug or a door slammed in my face, and while she used to cling to my literal leg and beg me not to leave her at daycare, I feel like I am clinging to her figurative leg and begging her not to become a sullen teenager. Georgia, who was but a queasy feeling in my gut back then, can now read and swim and make herself a bowl of cereal. She makes me laugh more than just about anyone I’ve ever known, and she has a great capacity for both silliness and kindness, as well as a perfect ear for music. I want them to stay these ages forever. I want them to keep growing and changing. Both of these things are true and eternally true; I said them last year, too. It seems weird to claim credit for my kids because while I do keep them alive and try to make sure they grow into decent people with morals and values and table manners, I also understand that they are not entirely a reflection of me; they are their own amazing people. Still, at a time of year when we reflect on our blessings, my kids are right there at the tip-top. Sure, I was proud of those crab puffs I made back in 2003, and the flourless chocolate cake in 2005 was a showstopper. But when it comes down to my greatest masterpieces? It’s always going to be my kids.